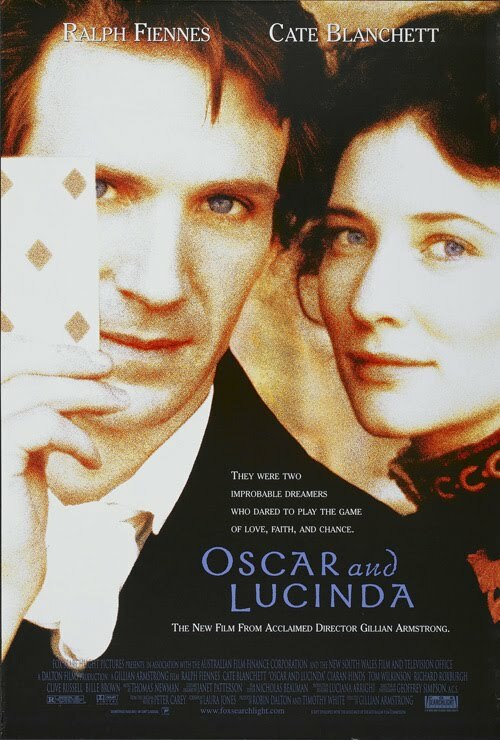 Certainly one of the more original films I’ve viewed in some time, Gillian Armstrong’s 1997 film Oscar and Lucinda tells the story of two lost souls who find each other through a shared obsession with gambling. Although in the decade-plus since this was released, gambling, specifically poker, has enjoyed a colossal resurgence in popular culture, this film is highly character driven and gambling plays no role beyond establishing character distinctions. Besides, this is particularly unusual in that it’s a period piece—taking place in mid-nineteenth-century England and Australia. Although one could argue that at the time of this writing Oscar winner Cate Blanchett’s star is brighter than that of Ralph Fiennes, that certainly wasn’t the case in 1997 when Oscar and Lucinda was in theaters. The pair shared a similar amount of feature film experience and years in front of the camera, but by 1997 Fiennes had already headlined two Best Picture winners (Schindler's List and The English Patient) and had achieved household name status in the United States via other Hollywood films such as Quiz Show and Strange Days. Blanchett was an unknown at the time, with her breakout performance in Elizabeth a year away. Consequently, and in spite of the pair of first names in the title, this treatment of Peter Carey’s novel focuses on Fienne’s character Oscar, with Blanchett’s Lucinda in a featured supporting role. In a nutshell, the movie concentrates much more of its running time on what Oscar does and thinks and shares much less about Lucinda, beyond how her actions serve to inspire Oscar’s. I began with the originality of the film and it’s worth discussing. Although this is a character study the circumstances of the plot are quite novel and do much to keep moving forward. I want to be careful to not give anything away, because even though gambling is a significant element of the narrative, one wager in particular defines the second half of the movie and it shouldn’t be spoiled. Suffice it to say that the movie goes places (as literary adaptations often do) that are atypical of Hollywood narratives—and then some. It’s occasionally tender, often unsettling, and in at least one instance abhorrent—all played out within constructs of love: platonic, religious, and obsessive. Perhaps what’s most astonishing about Oscar and Lucinda is that all of its drama is brought to life through Fienne’s performance, which may be his best—he’s sublime in a role so difficult most actors wouldn’t go near it. Oscar and Lucinda was released with the Academy Awards in mind: it hit theaters on December 31, 1997, the last day of eligibility. This was the year defined by the competition between Titanic, As Good as it Gets, and L.A. Confidential, with the comedy film The Full Monty also garnering a Best Picture nomination. I certainly would have argued for this instead. Yet in spite of broad critical acclaim this garnered only a single nomination in the Best Costume category. Get your hands on a copy and decide for yourself. I had forgotten about Oscar and Lucinda, I remember thinking it was a gem many years ago on TV. I might see it again some time ( : I agree, it kind of got forgotten that year among those other Oscar contenders. Good job highlighting this film, which more people ought to discover. Will you be reviewing other recent films (90s 00s)? Hi moviesandsongs -- I missed your comment. thanks for posting! I hope to review more films from the 90s, maybe even a new film now and then! My problem is that I don't watch very many current films, and when I do I feel like they get all the ink they need without me chipping in. Hopefully, I can uncover a few more nearly-forgotten gems like Oscar and Lucinda to write about.